The Promise Pegasus2 series with Thunderbolt 2 technology delivers blistering performance to professionals creating rich, ultra-high resolution media. Pegasus2 maximizes the available line rate of Thunderbolt 2, enabling video creators to transfer and display 4K video files simultaneously. Pegasus2, the world's first RAID 5 solution with Thunderbolt 2 technology, enables pros and enthusiasts to create, edit and view live 4K video streams, while simultaneously backing up the files to their Pegasus2 while still being able to use the same cables and connectors as the previous generation. 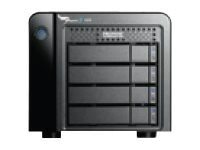 Pegasus has become the benchmark by which all Thunderbolt storage is measured. Simplify and accelerate your workflow. Safely backup massive creative projects. Create, edit, view, and share brilliant 3D and 4K video.